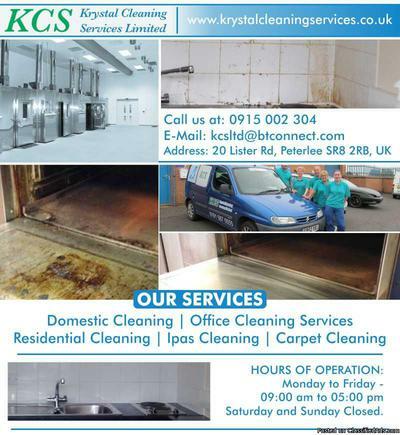 Planning on getting a cleaning service for your commercial place? Messed up by seeing the load of work? Looking for commercial cleaning services for help? Don’t worry and count on Krystal Cleaning Services. They are a Stockholm based cleaning company offering High Level cleaning services to the commercial as well as residential houses. They understand how difficult it can be to clean a commercial place with so many aspects and limited amount of time. They offer highly efficient services in cleaning services. Contact them for further details. E-Mail: kcsltd@btconnect.com » Address: 20 Lister Rd, Peterlee SR8 2RB, UK Visit: http://www.krystalcleaningservices.co.uk » Method of Payments: Cash/Cheque/Bank Transfer Hours of operation: Monday to Friday - 09:00AM to 05:00 PM / Saturday and Sunday Closed.